Set in the heart of the historical district, Casa Pedro Loza Petite Hotel is an oasis of peace and comfort for vacation or business travelers. 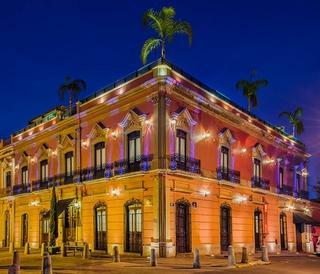 The gracious old mansion dates from 1848, when it was built for the Archbishopric of Guadalajara. Its history is fascinating. Located on the Andador Pedro Loza pedestrian walkway, the hotel and the street are both named after the beloved Archbishop of Guadalajara, Pedro Loza y Pardave (1815-1898). During the Cristero War in the late 1920s, Archbishop Francisco Orozco y Jimenez was living in the Guadalajara home. He placed a baptismal font in the room facing Calle Angulo and performed sacramental rites through an open window at night. An underground passageway leading from the carriage house to the Cathedral — an eight-minute walk away — was in use at the time.Spacious salons open onto the main patio, the heart of the home, and the bedrooms are distributed around it on the second floor. Thus, the mansion lends itself perfectly to the boutique hotel concept.